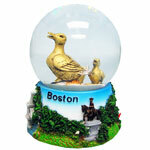 Please Note: Zakim Bridge Water Globe is currently backordered. There may be a 3-4 day delay in shipping. 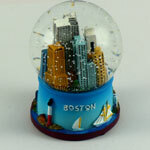 Boston's Zakim Bridge inside a water globe. With images of Boston around the base, including the old state house, the Old North Church, Faneuil Hall, Boston Light House, and the Boston waterfront. Base has the word, BOSTON on it. Approximately 4" high x 3" in diameter.